This is probably the most well-known piece of mindfulness practice. 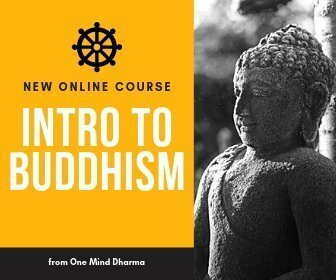 If you’re just starting to practice Buddhism, you probably already know a little bit about mindfulness. With mindfulness, we are present with whatever is going on in our experience. In meditation practice, this is commonly practiced with the breath, the body, and the mental reactions to experience. If we are not present, we cannot practice mindfulness. If the mind is wandering to the past or future, we can notice it is doing so. In a strange paradox, we can be present and mindful when the mind is wandering to the past or future. This is because mindfulness is really a quality of awareness, not of the thinking mind. Once we’re present, we simply observe. Whatever is present in our experience, we look at it with our awareness. As we tune into our present-time experience, we really try to observe what is arising. Whether this is the breath, a sound, or anything else coming up, we bring our awareness to the experience and familiarize ourselves with it. Sometimes, we are called to simply observe. Other times, part of a healthy practice means intervening. For example, we may notice while sitting in meditation that our knee hurts. With mindfulness, we tune in and get to know what it actually feels like. However, there may come a point where we recognize that we need to take action and mindfully move. As we move we can continue with mindfulness, seeing how it feels to adjust the body. In mindfulness practice, we recognize when something is happening that causes freedom or ease, and we recognize when something is happening that is causing us suffering. If we find ourselves resisting a thought or tightening around an experience, we can recognize that we are creating pain for ourselves. If we sit in a way that feels healthy and kind to the body, we recognize that sitting like this leads to ease in the body. This is a crucial piece of mindfulness practice. If we’re just present with whatever is going on, we wouldn’t necessarily change how we respond or grow. By remembering what serves us we can cultivate wholesome qualities like compassion, gentleness, and wisdom and let go of unwholesome qualities like resentment, fear, and conceit. You may find yourself wondering what is right and wrong in your practice. Remember that the mind is going to think, that mindfulness is a practice that takes time to cultivate, and that it’s a learning process. There isn’t one single right way. Many mindfulness teachers from different traditions offer different ways to practice, so find what works for you! Perhaps you have heard that a friend meditates for 30 or 45 minutes a day and think that this is what you should be doing. Instead, investigate for yourself what is useful. If you’re a true beginner to mindfulness, start with five minutes of practice. Don’t overwhelm yourself with what you think you “should” be doing, and instead tune into what is working for you. If you can, try to build some consistency with your practice. Set the intention to sit regularly, whether it is every day or a few times a week. As you sit more regularly, you will build a habit and continuity of insight. Having a meditation teacher can be extremely beneficial, but it’s not necessary to begin practicing. You may find a mindfulness teacher to work with or teachings online via a podcast, YouTube, or elsewhere. When will I notice benefits? Mindfulness practice is not always fruitful immediately. Practice may help us build concentration and settle the mind in the moment, but it takes some time for the practice to impact our lives. If you can sit regularly for a few weeks, you may notice moments of mindfulness arising more frequently throughout your days. Patience is an important part of the path. Notice when you are growing inpatient or craving to feel something other than you are. If you’re sitting in practice and confused about what you should be doing exactly, you can only return to the breath. Listening to guided meditations is a great way to go, as a teacher will guide you through the practice with instruction. Here are a few resources for investigating mindfulness a bit further. We have some of our own pages and resources, along with external resources we love and recommend.